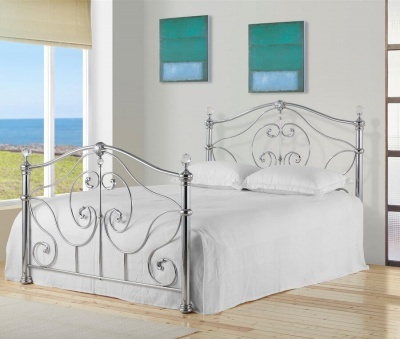 An elegant addition to your bedroom. The sleigh head and foot-boards give the Amelia bed a romantic feel. Traditional feel of the bed suits modern and traditional bedrooms. Elite pocket mattress: Made in the UK. 1000 pocket sprung unit. Hand Tufted. 1000 gsm spring insulator pad, 800 gsm polyester filing, luxury damask quilted cover, quilted boarder with air vents. 25 cm deep. Memory pocket mattress: Made in the UK. Features a one inch layer of memory foam on the top surface. 1000 pocket sprung unit. Hand tufted. 1000 gsm spring insulator pad, 800 gsm polyester filing, luxury damask quilted cover, quilted border with air vents. 25.5 cm deep. The bed frame is delivered in four boxes.